This tutorial briefly explains phases and walks the user through the process of adding a new phase to a form. 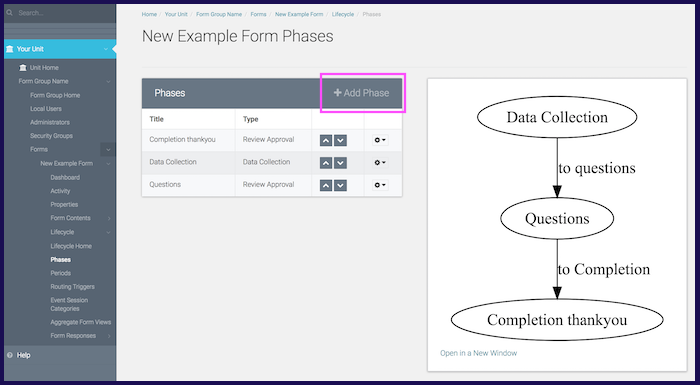 In order to build a form, you must use phases to differentiate between the parts of the form and to establish exactly how the form will function. Data Collection: This phase is the one that your form responder sees directly. The questions listed on your form will be located in this phase. Review Approval: This is the back-end of the form that typically only the form administrators need access to. For example, if the form is an order form, the administrator can approve the order placed by the form responder in the review approval phase. Archive: The archive is where all form responses are stored, including all interactions this form response encounters throughout the period. Each type of phase has permissions that need to be set to ensure the phase works properly. 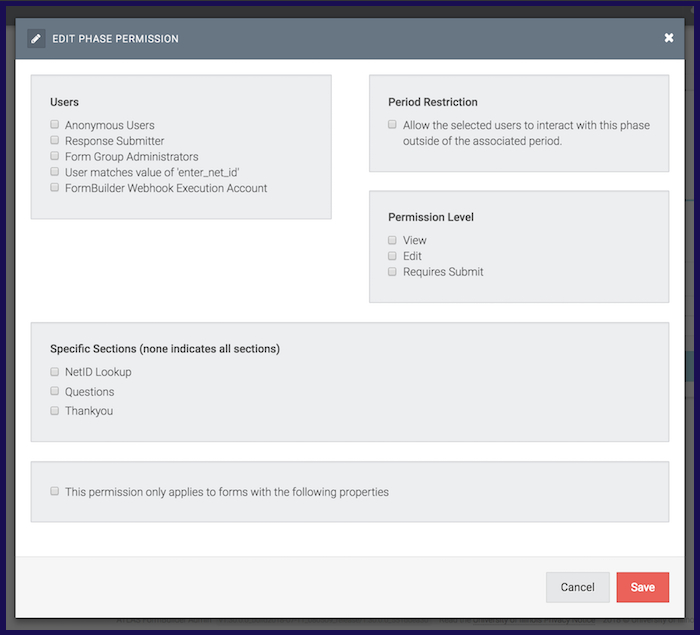 These permissions allow you to customize who has access to specific parts of the form which is helpful when creating a special form. 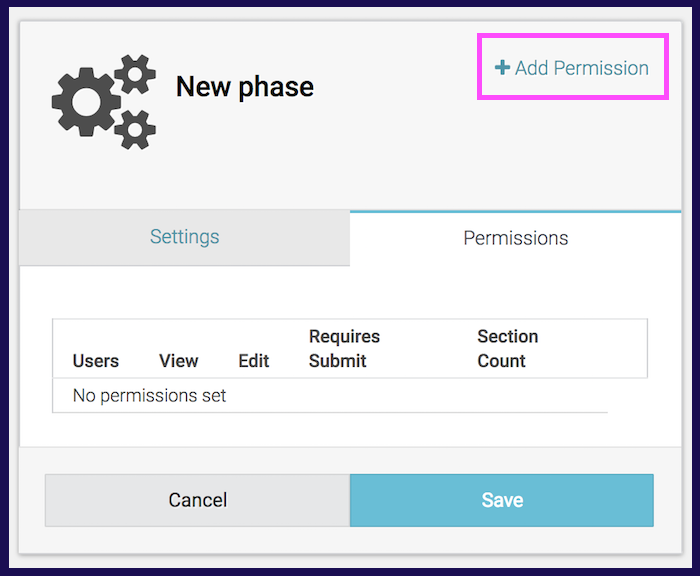 For a tutorial on how to set up phase permissions, check out ATLAS FormBuilder - How to Create a Phase Permission. Aside from permissions, phases also need to be assigned routing triggers, which effectually link your form together into a chain. This chain represents the entire set of actions that occur, starting from when a form responder begins to fill out a form and ending when that form response is archived in your database. For more information on routing triggers and how to set them up, check out ATLAS FormBuilder - Lifecycle - How to Build a Routing Trigger. 1.) 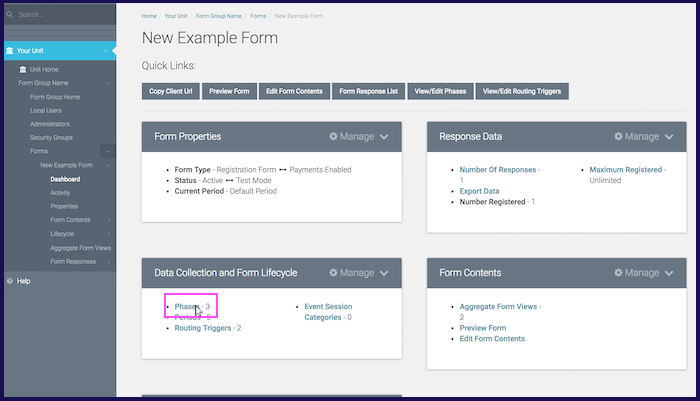 Select "Phases" under the Data Collection and Form Lifecycle tab on the form dashboard. 2.) Select "+ Add Phase" in the Phases tab. If you are creating the first phase of your form, the list beneath the tab will be blank. If you are creating an additional phase, a list of existing phases will be displayed below, as shown here. You can edit these by clicking the gear icon next to the phase. 3.) A new box will pop up on the right-hand side of the screen, like the one shown below. If creating a new phase, give it a name and classification in the fields listed. To assign the phase permissions, navigate to the Permissions tab. 4.) 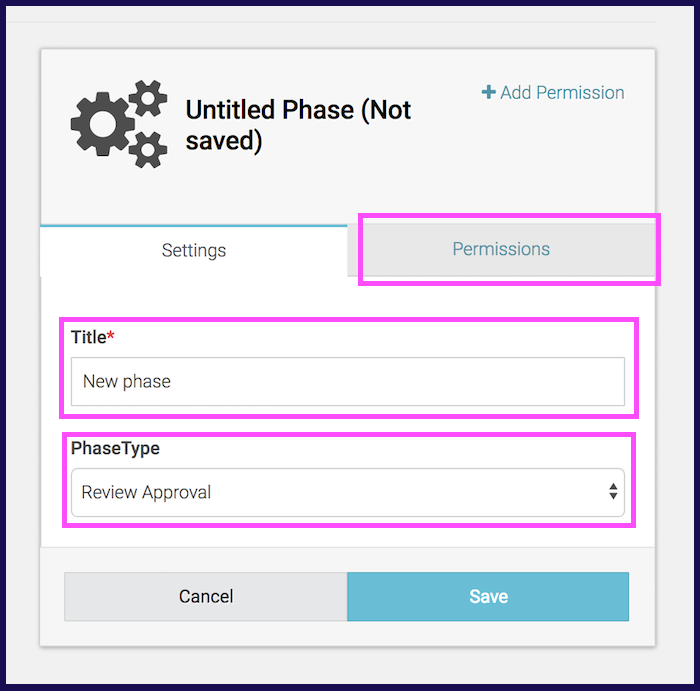 To add a phase permission, select "+ Add Permission". 5.) 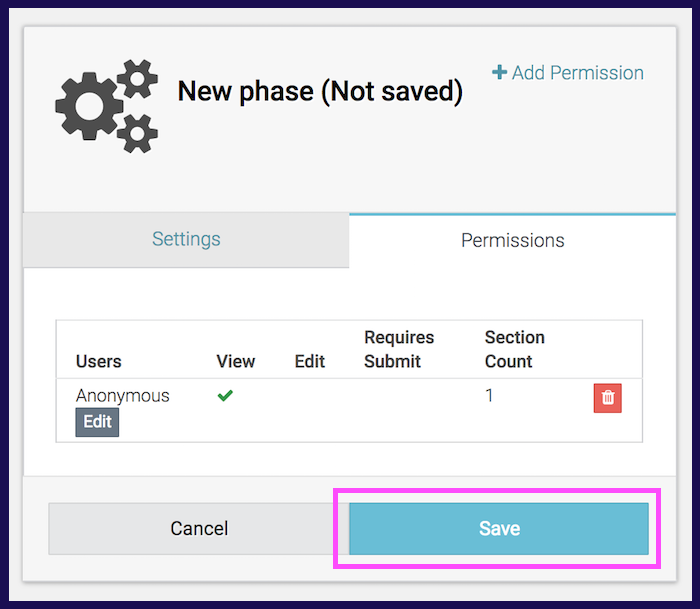 For more specific instructions on how to set up phase permissions, check out ATLAS FormBuilder - How to Create a Phase Permission. 6.) Remember to save your new phase by selecting the blue "Save" button at the bottom of the box. To delete a phase permission, select the red trash icon on the right. To edit a phase permission, select the "Edit" button on the permission you wish to edit.